Mohair fibre is notable for its high lustre and sheen, and it takes dyes very well. 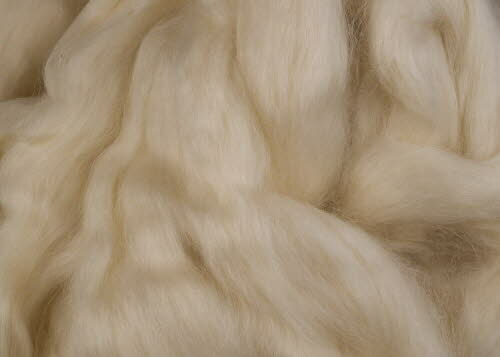 Our fibre comes from kid mohair, at 24 to 26 micron. Mohair is both durable and resilient, it is also resistant to abrasion, making it a natural substitute to nylon in sock wool blends; it is also useful for warp yarns. Although mohair has good insulating properties, clothing made with 100% mohair may feel cold to first touch. Textiles made from mohair have good crease resistance and tend not to felt or shrink. Mohair is made from the hair of the graceful Angora goats, which have a single coat and often have spiral horns.